Hatters interim boss Mick Harford will warn his table-topping side just what to expect when Wycombe Wanderers visit Kenilworth Road this afternoon. 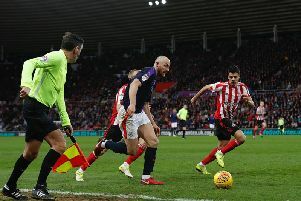 The Chairboys were recently branded as 'the worst I've seen, terrible, really terrible," by Plymouth chief Derek Adams, for their time-wasting tactics during a 1-0 defeat for the Pilgrims. He also went on to add: "I don't see how you can come here as a football supporter," after being frustrated by the amount of stoppages during the game, something games involving Wycombe are notorious for. However, Harford appreciated that the visitors have every right to play in that manner, saying: "There’s lots of ways to win football matches. "With respect to Wycombe, if you have (Adebayo) Akinfenwa in your team you play a certain way and the lad's a real effective player at this level and the level below last season. "He was excellent in terms of what he did and the disorganisation he causes teams if you allow him to do what he wants to do. "He can be a real positive player for Wycombe, so we have to make our players aware of their dangers they’ve got lots of threats, so we’ll be aware of that. "We are in a great position, we will get their feet back down on the ground after a great win at Shrewsbury and tell them what is expected against Wycombe, which will be a massive game." Harford is a big fan of the job Wanderers boss Gareth Ainsworth has done at Adams Park though, as the pair were at Wimbledon together earlier in their careers. He continued: "I know Gareth very well, I've known Gareth for a long, long time. "I was coaching with Joe (Kinnnear) when we signed Gareth, signed him from Port Vale. “Gareth is a working manager, he’s out at games, I see him at a lot of games. "They haven't got a big scouting network at Wycombe and their recruitment policy is very, very good, if you look what they’ve brought in in the past. "He’s been a very successful manager and he’s been touted around for a few jobs here and there, but I’m absolutely pleased for him, because he’s a good guy. "He's a great lad, great attitude and his team will mirror him obviously, in terms of the work ethic, the way he wants to play. "They’ve been very, very difficult opponents whenever we’ve played them and over numerous times this season, I’ve watched them. "They’re a real well oiled outfit, they know what they’re doing, they’ll have a shape in which they play to and they’re a good outfit, so it will be a real tough test for us."